Rhinestone rondelles - round shape. 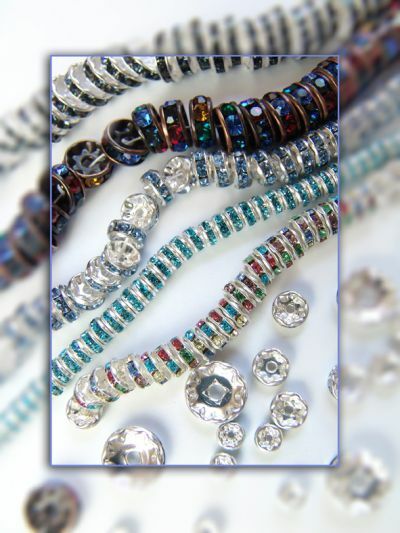 02.07.2010 - New bijoux component in our offer are the rhinestone rondelles . They are usually used as spacers between two other strung beads. Our rondelles are made in Czech Republic from MC rhinestones that are fixed in the round shape by nickel free brass components. If the required balls are not in stock, we will get them for you asap. Standart available colors except crystal and crystal AB are: Aqua, Lt.Saphire, Saphire, Montana, Jonquil, Topaz, Smokie Topaz, Black Diamond, Jet, Lt. Rose, Red Rose, Fuchsia, Lt. Amethyst, Amethyst, Hyacinth, Lt. Siam, Siam, Peridot, Olivine, Blue Zircon, Emerald. Quantity discount for bigger orders guaranteed! We are open to price match!